First, let me give @peternlewis a huge thank you for providing the Custom HTML Prompt action as a new feature in KM7. This is really huge, and opens up all kinds of opportunities/solutions we didn't have before. 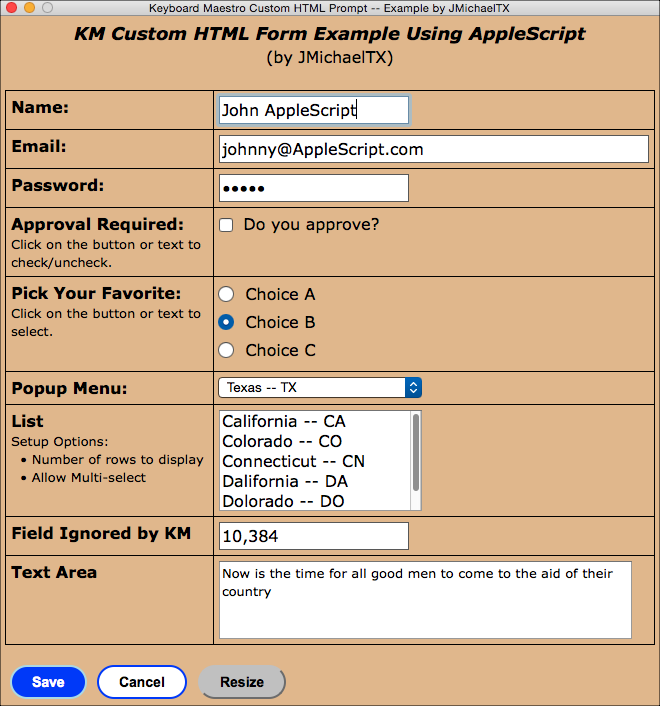 One opportunity I am very interested in is using this KM HTML form with scripts like AppleScript and JXA. Neither of these have support for HTML dialogs natively, and the dialogs available are very simple. So, I have learned that I can create an AppleScript that executes a KM Macro with a Custom HTML Prompt action, and waits for the action to complete before continuing the script. So we start the process with AppleScript, and stay in AppleScript entirely, except for when we want to show the HTML form via KM. Again, this is huge, IMO. Turns out it is not that hard to build such a script, once you know how. LOL I know, that sounds stupid, but what I mean is that the resulting script and the HTML file are pretty simple once you understand how to put the parts together. If anyone finds any bugs or issues, or have suggestions for improvements, please post here. The KM Macro is extremely simple since it is just a placeholder that all scripts can execute. Each script just needs to set a KM variable with the POSIX path to the HTML file before executing the macro. I have now added this JXA script file, which I really like better. There is an apparent BUG in KM, causing it to return a value of "Password", instead of the actual value, for any KM variable that has been used in a HTML password form field. You can't use KM variables with an underscore ("_") in the name, since KM replaces "_" with a space when the HTML Form Field Name is returned to KM. Find any bugs/issues or have suggestions for improvement? KM variable that has been used in a HTML password form field. 2. You can't use KM variables with an underscore ("_") in the name, since KM replaces "_" with " " when the HTML Form Field Name is returned to KM. set strASName to "Mr. No Name"
set strASMessage to "Now is the time for all good men to come to the aid of their country"
set strHTMLFile to "/Users/Shared/Dropbox/SW/DEV/KM/KM7/Actions/Custom HTML Prompt/KM-HTML-Form-Set-by-Applescript.html"
do script "[SCRIPT] HTML Form for Scripts"
--		and the KM var "HTML Result Button" will NOT be set. --		But we will treat it as if the user cancelled. --		was set to "TBD"
set strKMButton to value of variable "HTML Result Button"
set strASName to value of variable "ASName"
set strASEMail to value of variable "ASEmail"
set strASMessage to value of variable "ASMessage"
set strASPopup to value of variable "ASPopup"
set strASSelection to value of variable "ASSelection"
set strASRadio to value of variable "ASRadio"
set strAlertMsg to "Variables Updated via KM Form"
set strAlertTitle to "*** USER CANCELLED ***"
set strAlertMsg to "What Now?" end tell -- application "Keyboard Maestro Engine"
I can now add to this a JXA script file, which I really like better. Both script files have had limited testing, so please report any bugs, issues, or concerns that you may find with them. And if you have any suggestions for improvements, or a better or alternate script, then please post that as well. None of these files are intended for production use. They are all just examples that will hopefully help you get started using the great KM Custom HTML Prompt action with your scripts. Remember that the primary/lead tool in this process is the script. You start by running the script, not the macro. The script then calls the KM macro at the appropriate point. I look forward to seeing your feedback, and hope that we call learn together. Note: the code alignment here looks weird. I think it's due to the number of spaces for a TAB char that the forum uses, vs what I use, which is 2 spaces/TAB. oKMV["ASCheckbox"] = "0"		// will be set to Boolean after form processing. oKMV["ASMessage"] = "Now is the time for all good men to come to the aid of their country"
strAlertTitle = "SUCCESS! User Saved Form"
strAlertMsg		= "Now Process Form Data"
strAlertTitle = "User Cancelled Form"
So is this first link the best one to use or the last reference Here? what's the process for installing this? Install the KM Macro as normal -- just double-click on the .kmmacros file. Put the .html file anywhere you like. Open the JXA Script in Script Editor. Please let me know if you have any further questions, or issues with running the script. Actually I got the form to open when firing the Keyboard Maestro macro by clicking on the folder icon in the 3rd action (Custom HTML Prompt ‘Unknown’ and navigating to the file. Should I change the text back to what you have written? Should I change the text back to what you have written? As it states, the macro is not intended to be run directly. It is to be run ONLY from a script. The script will set that KM variable that contains the path. This allows different scripts to use different HTML files, but the same KM macro. Ok. So what can I use this for? Where can I direct the output? 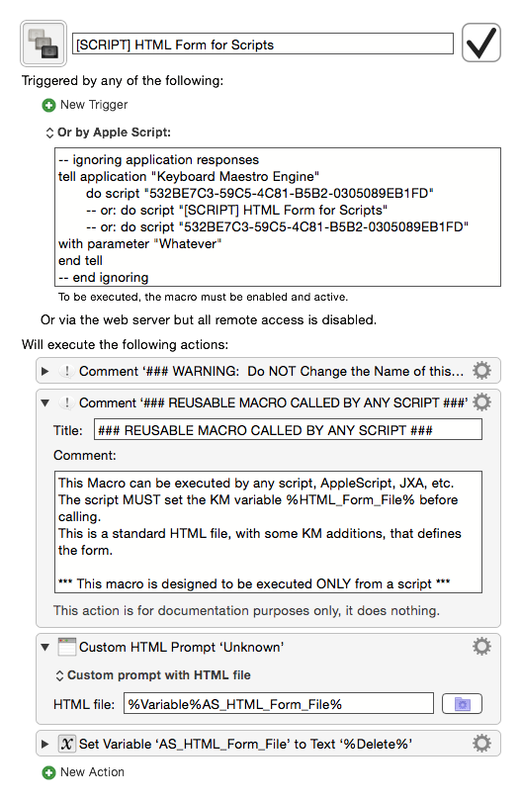 The only purpose of the macro and scripts in this topic is to show how to display a KM HTML prompt from a script, rather than having to start with a KM Macro. How you use it is totally up to you. I plan to use it for scripts where I need a more complex UI than AppleScript or JXA can provide natively (using display dialog commands). Essentially, the HTML Prompt provides a very rich text, full featured UI that is only limited by your imagination and skill. The output of the HTML Prompt is to KM Variables. So, after the user closes the HTML Prompt, the script needs to read those KM variables. I can think of some great uses but how to implement them is the question. For example since Keyboard Maestro has a webserver (which I haven’t explored at all) I can see creating a form to add records to a database I manage that others input data to. I could use this as a method of controlling user input which would get emailed to me and I could enter the record since there’s a problem with messy record entry. I could watch over stuff that comes down the pipe so to speak. if there’s a particular thread you are updating on this, I think it’s one I’d like to watch. I haven’t planned to have one thread for this, but if I did this one would be it.